Hospital Administrator Deborah Otka holds a Doctor of Pharmacy and has more than 14 years of experience in pharmacy, patient care and customer services. Her background will be invaluable in assisting our clients and ensuring that Noank-Mystic Veterinary Hospital becomes the model of veterinary care in our area. "Owning this hospital is something that my husband and I have worked for," she said. "We take pride in providing our patients with the quality care we know they deserve. Outside of the hospital, Deborah enjoys tennis, ballroom and Latin dancing, swimming, playing the piano, gardening and spending time with her family - furry and non-furry! Veterinary Technician Supervisor Natasha Lutz joined our hospital in 2015 and has since proved herself to be a valuable team member. Natasha helps by assisting the doctors in the surgery suite, providing critical care treatments, performing requested labs and diagnostics, ensuring clients are fully educated, managing hospital inventory and special orders, staff training, hiring, schedule making, and much more! "I love utilizing the lab equipment and providing the best care for our patients," she says. 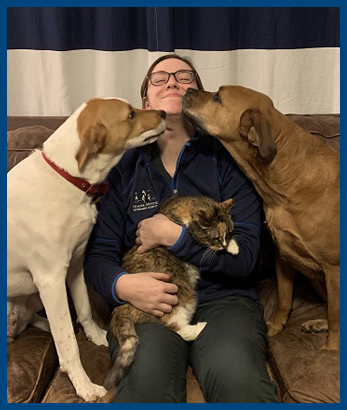 "I enjoy working at NMVH because it has many state-of-the-art features that I have not seen at other veterinary hospitals that I've previously taken my pets to." Natasha holds a bachelor's degree in Biology and Forensic Science from Syracuse University. She has three dogs of her own, Angus, Russell and Margot, as well as an African helmeted turtle named Xena. In her free time, she enjoys learning more about biology, forensic science, and animal conservation. She also likes to cook, draw, travel, and practice karate. Natasha also volunteers with the Connecticut Human Society. Ashley will help with blood draws, catheters, dental cleanings, vaccines, client education and more. 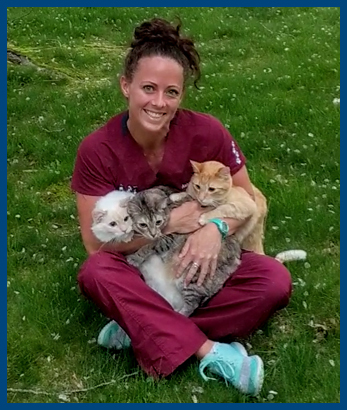 Ashley started her career with an Animal Science Degree from Holyoke Community College and has been in animal-related fields for over six years. Ashley enjoys helping animals get back to optimum health. 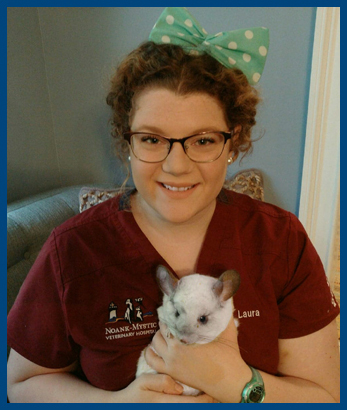 Ashley enjoys working with all different kinds of pets, and loves meeting new exotic pet patients. She loves the team atmosphere at Noank-Mystic Veterinary Hospital and how kind everyone is. Her boundless energy and outgoing personality make her a wonderful asset to the team. She also is incredibly strong and always ready to help lift heavier animals and equipment! At home, she takes care of her three cats: Opie, Camille and Bailey. 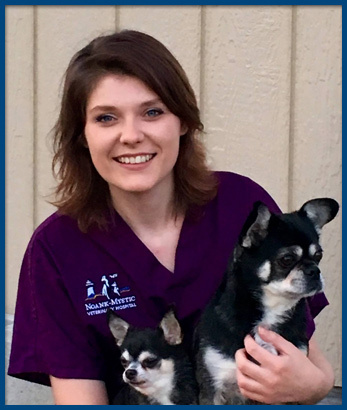 Laura is a full-time Assistant Veterinary Technician here at Noank-Mystic Veterinary Hospital. 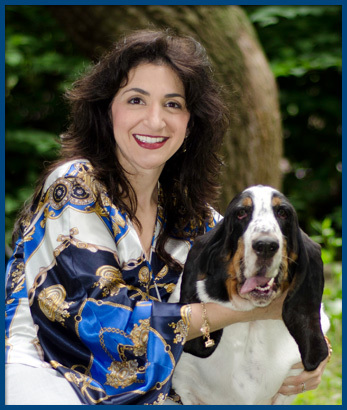 She is passionate about and dedicated to making a difference in animals lives. Some of her job responsibilities include feedings, weighing the animals, cleaning, and assisting our staff. When she isn’t working, Laura spends a lot of time volunteering at local animal shelters. She also enjoys baking traditional desserts and trips to the beach. At home, Laura cares for her two cats Mowgli and Gryffin, and her chinchillas, Lyla and Winnie. Olivia is a part-time receptionist here at Noank-Mystic Veterinary Hospital. She is currently enrolled in school and working towards a B.S. in Animal Science. Some of Olivia’s responsibilities include scheduling appointments and greeting our patients and clients. She loves being apart of a friendly and caring team in which patient care is the number 1 priority. At home, Olivia cares for 3 dogs and 3 cats of her own. She enjoys hiking, skiing, ice skating, and hockey.